We believe that this may be the best warranty in the air conditioning business. The compressor in your new ASZC18 heat pump system is covered by a Lifetime Limited Warranty. * If the compressor ever fails, a new heat pump unit will be provided to the original purchaser of the central heat pump system as long as they live in the same single-family residence. All remaining functional parts are covered by a 10-Year Parts Limited Warranty*. For a full description of all warranties applicable to this product, please call us. We believe that this may be the best warranty in the air conditioning business. The compressor in your new ASZC16 heat pump system is covered by a Lifetime Limited Warranty*. If the compressor ever fails, a new heat pump unit will be provided to the original purchaser of the central heat pump system as long as they live in the same single-family residence. All remaining functional parts are covered by a 10-Year Parts Limited Warranty*. For a full description of all warranties applicable to this product, please call us. The compressor and functional parts in your new ASZ14 system are covered by a 10-Year Parts Limited Warranty*. For a full description of all warranties applicable to this product, please call us. The owner of this heat pump system will appreciate the year-round energy savings and money-saving comfort that thisproduct delivers year after year. Further, the unit features an attractive louvered metal coil guard that protects the coil from damage plus a powder-paint finish that provides premium durability and improved UV protection. 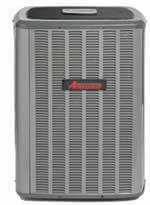 The Amana® brand ASZ13 Heat Pump uses the chlorine free refrigerant R-410A and features operating sound levels that are believe to be among the best in the heating and cooling industry. The ASZ13 features an energy-efficient Copeland® scroll compressor that provides improved temperature and humidity control. The compressor and functional parts in your new ASZ13 system are covered by a 10-Year Parts Limited Warranty*. For a full description of all warranties applicable to this product, please call us. With this heat pump system, you will enjoy year-round comfort, thanks to energy efficiencies and operating sound levels that we believe to be among the best in the heating and cooling industry — all at a refreshingly affordable price. The compressor in your new SSZ16 heat pump system is covered by a Lifetime Limited Warranty*. If the compressor ever fails, a new one will be provided to the original purchaser of the heat pump system as long as they live in the same single-family residence. For a full description of all warranties applicable to this product, please call us. Value-driven engineering, money-saving performance, reliable components, and Amana brand quality manufacturing make this unit perfect for the value-minded homeowner who desires both heating and cooling comfort in one system. 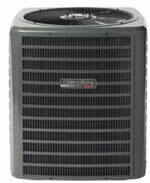 This heat pump system will provide your home with dependable, heating and cooling comfort for many years. It’s designed for a value-conscious homeowner who appreciates the energy savings possible with a new heat pump indoor comfort system.